Hotbuttonpress: Welcome, Eric. 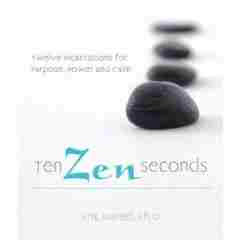 I'd like to start off by saying how elegant your new book Ten Zen Seconds is, and how graceful a read. It's a beautiful piece of work. As I thought of questions to ask you about the Ten Zen Seconds technique as applied to the writing life, of course I focused on my own challenges. Like many artists and writers, I struggle with persistent procrastination. Is this more prevalent in creative personalities or is it just part of the human condition? Eric: Procrastination is an anxiety state and if something makes us anxious and we have the opportunity to avoid it, then we avoid it. Creating is one of the things that make people anxious, because it is hard work, because it demands that we think and feel, and because the likelihood of making “mistakes” is high, so we are likely to simply avoid the encounter. Two things are going on: that creating makes us anxious and that it is easy to avoid it. This same phenomenon occurs everywhere in human affairs where anxiety is present: it is entirely a feature of the human condition. What advice and specific incantation(s) would you recommend to prepare for the entire process.... sort of an overall incantation to set the tone? Hotbuttonpress: What specific incantation might be used to jumpstart the beginning of a writing project, when the writer is staring at a blank screen or sheet of paper? Eric: I think that there are many viable approaches. One is to use incantation 2, “I expect nothing,” to help let go of the need for outcomes and to open up to whatever ideas and images want to come forward. In this way you help yourself avoid thinking “the same old thoughts,” the safe thoughts that are lurking around waiting be employed. If you are heading in a new direction, it might be useful to start out with “I am free of the past,” in this case your “writing past,” so that you can gain real permission from yourself to write something new and not something like your last book or your most popular book. I think that each of the 12 incantations can be used at such a moment, each in its own idiosyncratic way. Hotbuttonpress: What incantation would help with the dreaded Middle stage.... and this is so important to me because rewriting is my nemesis, and I could use all the help I can get with revising and editing? Eric: Revising is an act of will, not an act of craft. It is the writer saying to herself, “I did something which is not yet done and now I must face the music and turn this draft into something excellent and complete.” Helping yourself remember that courage is what’s required is tremendously important and so “I make my meaning” and “I am equal to this challenge” are probably the two most useful incantations in this context. You must take responsibility for turning the draft into a finished thing—that is exactly what “I make my meaning” connotes and demands. Hotbuttonpress: Finally, what incantation could help a writer get the work "out there", and once it's published, aid the writer in marketing the book? Eric: I think that getting down to the business of publishing, which has to do with networking, entering into relationships with agents and editors, creating good products and also good ancillary materials like email queries, and building your platform all require the kind of attention that an incantation like “I embrace this moment” or “I am taking action” promotes. This is work, not pleasure, and requires action, not inaction. And between each piece of business, “I am completely stopping”—so that you come to the next thing centered rather than in a lather and in a rush. Hotbuttonpress: Are there any writers out there who are really good at all the aspects of writing, or is it normal to resist one area more than another? Eric: It is normal to resist one area or another. I think that, broadly speaking, there are the “real writers” and the “real marketers,” but I have met enough writers, often bestselling ones, who embrace both aspects of the writing life with equal energy and attention and who have learned—whether or not it came naturally initially—how to integrate these various parts into a seamless whole. So it looks like the integration is possible—if you work at it. Hotbuttonpress: You give advice in Ten Zen Seconds on how creatives can modify the incantations and even create their own. I'd like to suggest another because creative folks tend to be so hard on themselves. How about "I am doing very well." What do you think of that as a ten-second incantation when the inner judge is present? Eric: Love it! Creative people virtually NEVER celebrate the fact that they have just spent two arduous hours birthing a whole universe—they are much more inclined to say, “Well, I could have spent three hours. Bad me.” It is very important that we honor our good efforts, so, yes, “I am doing very well” is a winner! Hotbuttonpress: Before you leave, Eric, I notice that you have an Affiliate Marketing program for your publications. Can you tell us a little bit about how that works? Eric: That is for the ebooks that I sell from my site—there are three ebooks currently and the one that people buy most often is “Becoming a Creativity Coach.” You can sell that book from your site, too—that what’s the affiliate program is about, you selling ebooks that I provide, which, once you get the hang of it, is a pretty simple process. Hotbuttonpress: Thank you for joining us today. Great success in this latest endeavor!